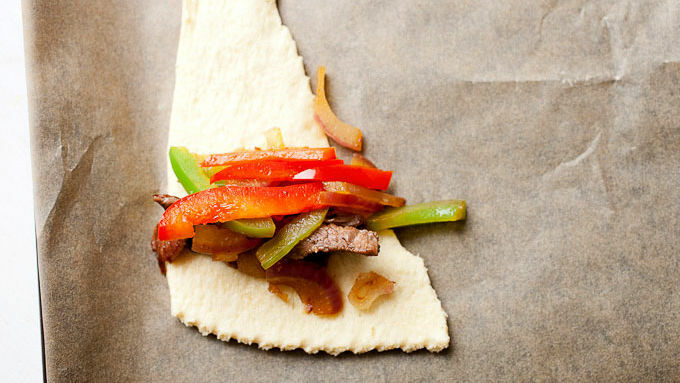 Slice steak, peppers, and onions into thin strips. In a large skillet over medium-high heat, add olive oil. Once the oil is hot, add steak and sear for about 1 minute per side. The steak will cook very quickly. 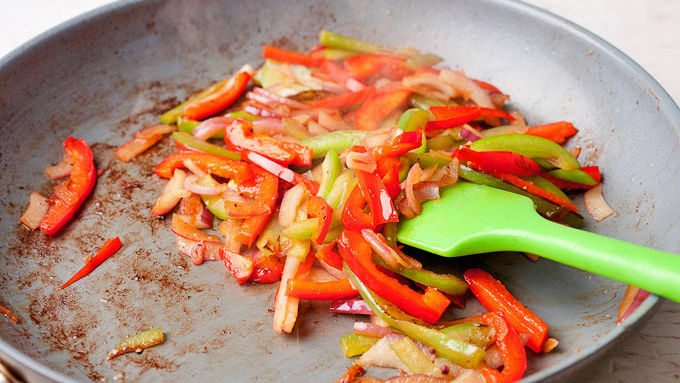 Remove steak from skillet and add peppers and onions. Season with salt and pepper and cook for a few minutes until veggies soften. Remove from heat and let cool so you can handle them. Preheat oven to 350°F. Working with one crescent piece at a time, stack on some steak and peppers near the widest end of the roll. Then roll the dough into a tight pocket. It’s okay if some of the filling sticks out the ends. 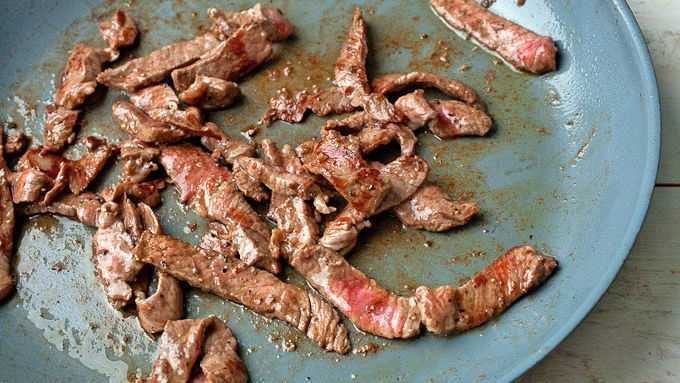 Place cheesesteak pocket on a baking sheet lined with parchment paper. Repeat until you’ve used all your crescent rolls. Bake for 13-15 minutes (slightly longer than package instructions) until rolls are golden brown. Remove and let cool slightly. While cheesesteak pockets bake, make cheese sauce by whisking butter and flour over low heat in a small pot. When the roux turns a light tan color, slowly whisk in milk to form a sauce. Let sauce thicken a bit as it heats up, stirring constantly, and then add grated cheese. Season cheese sauce with salt and pepper and keep warm over very low heat. 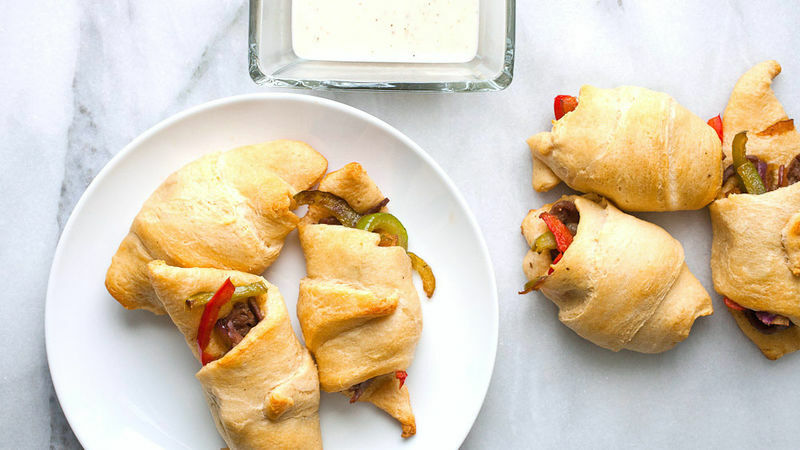 Serve baked cheesesteak crescent pockets with cheese sauce on the side. Sliced Sirloin, peppers, and onions wrapped in delicious dough with a cheese sauce! Oh, the Crescent roll! It teleports me back to my childhood. I can remember so many meals served with a side of rolls. So many, in fact, that I rarely use them as actual rolls these days. Go figure! Instead I use them in new and creative ways. They are a definite shortcut for so many recipes. 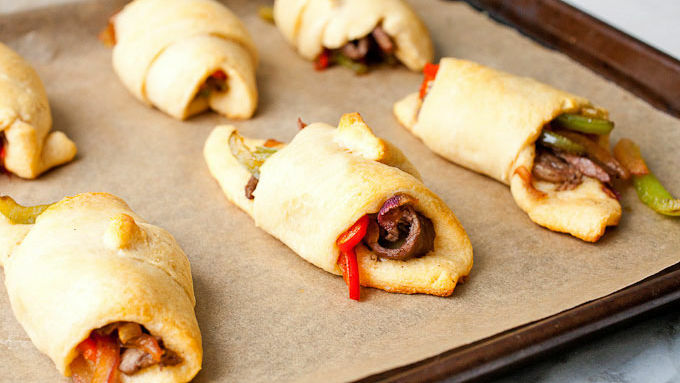 These cheesesteak crescent pockets are the perfect example. Relatively quick to make and you can make a meal out of them with a side salad or serve them as appetizers! When the cheesesteak pockets are done baking, serve them with the cheese sauce while they are still warm.